Morotai is known as one the best site for wreck diving in Indonesia, whereas many shipwrecks, airplane wrecks, truck and jeep wrecks as the WW II relics are easily can be found. This historical heritage based tourism would someday be destroyed if there are no such conservation efforts from the stakeholders. Apart from its sunken objects as tourism destination, Morotai Islands Regency is also quite for its coral reef abundance. This coral reef clusters are generally found in the western part of the island of Morotai where it is not exposed directly to the open Pacific ocean, but it across with Halmahera Island. In the western side of the Morotai Island, there are many islets that are protected by the surrounding atoll. It has long been believed that the strong Pacific underwater currents passing through Morotai Island also brings with it a variety of organisms and planktons that drift with ocean currents, making Morotai as a fertile coral reef region. But, the big question is how healthy and fertile is the coral reef in Morotai? Coral coverage in Aru Point based on data measured at a depth of 14-15 m, showed that 84% of this dive site is covered by Coral Reefs (approximately 40% of them is Acropora and 44% of them is soft coral). It is also cevered by algae (4%) and only 12% of them are categorized as abiotic (non living organisms such as rocks, sands, etc.). According to the State Minister of Environment of the Republic Indonesia Decree No. 4, 2001, the coral coverage in Aru Point is categorized as “Very Good”. Fariman Point topography is a slope with coral reef coverage of 55% is very famous for Blacktip Reef Shark (Carcharhinus melanopterus) sighting. The coral reefs here consists of Sponge type (20%), Soft Coral (13%) and Acropora Hard Coral ( 17%) and Non-Acropora Hard Coral (5%). Non-living organisms found in Fariman Point is categorised as 26% sands, 17% rocks, and 2% dead corals. According to the Ministry’s Classification, this site’s coral reef coverage is categorized as “Good”. 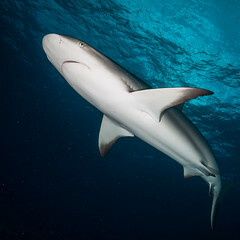 Blacktip point is known as the other location for the Blacktip Reef Shark (Carcharhinus melanopterus) sighting. As the famous places shark sighting, this dive site is covered by almost equavalent living versus non-living organisms which comprises 48% of coral coverage, and 49% of this location is coverage non-living materials, where the 3% remaining is covered by algae. Blacktip Point is considered having “Medium” level of coral reef coverage. The condition of coral coverage in this famous spot for Grey Reef Shark (Carcharhinus amblyrhincos) sighting is dominated by non-living materials (as much as 83%), the rest as just approximately 10% covered by Acropora type of Hard Coral and 5% are inhabited by Soft Corals, with the remaining are covered by Algae. By using the classification from the Ministry of Environmental, this dive site’s coral coverage is classified as “Damaged”. Shark Diving Indonesia will be consistent to do the research and continuously monitor the coral coverage in the Morotai Island and North Halmahera region, and strongly support the scientific acivity on Marine Lifes in this area. Most of the income from our guests who visit and dive in Morotai will be donated for the marine Science’s research activities. We wish you all to contribute and take part in our conservation effort based on scientific program by visit and dive in Morotai Island.